Rethinking the overall :: Can these classic dungarees pull off chic? Overalls en vogue? Is it possible to even use the two words in the same sentence? Can they be chic? As I start to see overalls popping up more and more in ads, on blogs and in magazines, I wonder can these dungarees actually be worn by women who want to take themselves seriously? Out in the garden, in the farm and in the artist's studio, these comfortable and easy pieces seem only fitting. But can they be pulled off to be seen as something chic, au courant, even fashionable? When photographed in the streets of New York City, Milan or Paris, well, of course they can. But what about elsewhere? What about on tony suburban sidewalks? Can a fitted blazer, a pair of heels, Valentino studs or otherwise bring elevate this frumpy item and bring it to a new level? Is this something that I can perhaps wear while at home writing then dash out to meet a client? Is this something that I can wear at my age... 40-something and not getting any younger? I had a great pair of overalls in my 20s. They were bright red and from GapKids. (When you are 5'4" you can sometimes get away with shopping in the kid's section - well at least I used to back then. Not so much anymore.) I wore those red overalls with pride. They were fun and funky. In my 30s I'm not sure I would have. I had evolved and my style had matured. I became conservative. Perhaps too conservative in style. Classic is always a good thing, but I had lost some of my edge. By the time I hit 40 I once again became more creative in my choice of style. It no longer mattered to me to fit in or what people thought. Always appropriate but always creative. And the older I get I find myself getting more and more creative with my dress. I don't conform to rules and regulations. I wear things that I feel look good on me and are comfortable. I spent too many years sacrificing comfort. And for what? How I dress is important. I represent high profile clients and luxury brands. Would I show up at a meeting in overalls? Probably not. But could I pull off the look in my day to day life - running errands, dining out, working? I think I just might. If I can stay home and work in a pair of jeans and nice shirt then toss on a blazer or jacket and heels when I leave the house, can I do the same with overalls? The jury is still out here. I would love to know what you think! Chic overalls with an edge. Image via Le Fashion. Stylecaster shows us that some pumps, jewelry and a pretty bag can transform overalls from drab to fab. I'm not altogether certain about the Mickey Mouse ears, but I love the black leather overalls and the Valentino shoes. Toss in a bike and Milan and no one will argue their chic-ness. Image via WWD. White on white. Leopard print. Pretty sandals. Say no more. Overalls go ultra chic. Image via Le Fashion. Are you sold yet, or not so sold? I have a thing for handbags. I love them all - large, small and everything in between. But in the summertime when the livin' is easy I want to shed those layers - both literally and figuratively. I want to leave my large carryalls behind - at home, at the office. The big totes are best left at the beach or on the boat. I want to lighten up. And, other than car keys, some money, my driver's licence, lipstick, phone and perhaps a pair of glasses what else could I possibly need? Nothing!! Whether I'm headed out to a summertime wedding, dinner at a fine restaurant, a bar, the country club or a clambake on the beach these 6 little clutches will perfect and compliment any outfit from formal to the most casual - from dresses to jeans to shorts. They can be paired with a pair of mules, slingbacks, sandals - even flip flops. These bags are meant to be carried with attitude, with pride... with a smile on your face and a spring in your step! It is an honor and a pleasure to have Bettie Bearden Pardee join us here today to share some of her tried and true entertaining tips. I hope you'll pour yourself a cup of coffee, tea or a glass of bubbly, which just happens to be Bettie's favorite, and stay awhile. Bettie Bearden Pardee is an author, lecturer, garden connoisseur, former magazine editor and television host/producer. Pardee who makes Newport, Rhode Island her home, has written several books on America’s favorite City by the Sea. First published in 1979, Newport in Flower: A History of Newport’s Horticultural Heritage was updated and re-issued by Bettie in 2010. In 2004 Bettie received an award for a “commitment to excellence" for Private Newport: At Home and in the Garden by the Horticultural Society of New York. Her most recent coffee table book, Living Newport: House, People, Style, published by Glitterati, gives readers a glimpse into the fabled town where privacy is a treasured asset. Living Newport: Houses, People, Style offers up an insider’s view of Newport, Rhode Island which has long been celebrated for its stunning seascapes, famous mansions, Jazz Festival, annual Flower Show and world-class sailing. In Living Newport readers will get a rare glimpse into this fabled town where privacy is a treasured asset offering sneak peeks into the lives of the “old guard” as well as the “new” Newport social set. These tastemakers have the means and the ability to live anywhere but have chosen this perennially-favored City by the Sea. Readers are invited in to see how this exclusive community entertains, decorates, parties, gardens and dresses. This accomplished hostess and active community leader has chaired many events including the Newport Flower Show, during which she received the Laurel Award for “creative, devoted and effective leadership” from the Preservation Society of Newport County. Bettie and her husband Jonathan, who was born in Newport, decided to make the illustrious City-By-The-Sea their year-round home. Her design talents and love of landscape were put to use in the design and building of their Newport retreat, Parterre which is the heart of Bettie’s creative endeavors. Parterre’s often-toured gardens have been documented in the Archives of American Gardens at the Smithsonian Institution and are featured in the Garden Club of America’s Gardens, Private and Personal. Suffice it to say, Bettie knows her flowers! What’s the inspiration behind your website? The inspiration was my latest book, Living Newport: Houses, People, Style, which is a follow-on to my earlier book, Private Newport: Houses, People, Style. Both are coffee table books capturing the private side of a very public destination. In each, the focus is on tastemakers who have the ability to live anywhere but choose Newport. We all love to peek behind closed doors and garden gates to see…how these friends entertain during the America’s Cup Trials...dress for “Coaching Weekend”…spend their hours on the water…whose garden turns out the blue ribbon roses at the Newport Flower Show... what decorating instincts inspired an historic boathouse redo. Having a website and a blog, Initial Thoughts is a very new experience for me, but I love it and have so much admiration for all the beautiful websites already out there…and those to come. It’s exciting to be part of this new frontier. Anything precious, not easily reproduced, in scant supply…like time. Or an exquisite flower that will only last a few days but prompts an almost overwhelming sense of awe at its exquisiteness. Being comfortable with yourself and not being a slave to trends is important and the true definition of style. At the same time, it behooves us to have the courage and the flair to bring self-expression to our homes, the way we decorate and dress, to the way we entertain. And always appreciating that a sense of appropriateness should be a first consideration. My mud room. All the things I love and that support my avocation and passion – my garden and flower arranging – are there. Shelves and shelves of books on both subjects, containers galore, baskets, stacks of hats, files for reference on so many topics, award ribbons from the Newport Flower Show, an English prie dieu from my church (a copy of the rush-seated ones at St. Paul’s Cathedral in London) odds and ends (plant markers, tools and accessories, gloves and rubber shoes.) And some of the original vellum sketches for my garden now disguise the front of the freezer door. Just thinking about entertaining brings a smile to my face. It’s been a way of life for me for as long as I can remember. In my family, growing up Southern was all about entertaining. If we weren’t planning a party we were enjoying memories of the last one or looking for an excuse for the next. My philosophy about entertaining is that for a very few halcyon hours you provide guests the opportunity to step out of their everyday world, put their cares aside, be tended to and then depart with a memory, a “souvenir of life” that will bring them a sense of well-being when they reflect back upon it. Entertaining does take time and energy to pull off, so best to make it fun for yourself from the beginning. My two fail safe fallbacks are 1) a theme, making an occasion of it. That’s another way to help guests feel special; show that you care enough to give this some thought. So for me it’s not just a Saturday lunch in January, but a “French Picnic by the Fireside.” Pique their interest, too, so they can enjoy the anticipation! What was the first party you hosted? I was about 8 or 9 years old. I’d created a bedroom tableau under a wisteria pergola (it was a short-lived episode, but it got my feet wet in the “world of design.”) After my friends finished playing on the badminton court, which fronted on the pergola, I’d coerce them into coming over for tea. They didn’t quite understand it, but they were good sports. What was the most memorable party you hosted? This past Valentine's Day still stands out in my mind for the happy confluence of circumstances that provided the opportunity to entertain dear family friends that I seldom have a chance to see. It was a sort of “reunion,” into which went a lot of heart and soul. As part of a party weekend that began with 110 friends from North Carolina and a white tie dinner dance at Rosecliff, my husband and I hosted a small dinner at our home for the daughters and sons of my parents’ dearest friends (all now deceased.) There was a table that had old pictures of our parents together, memorabilia, magazine clippings of old ads for a business venture they’d all invested in. The decorations were as much fun to put up as they were for a dinner setting and were kept under wraps until dinner was announced; they stopped just short of prom night, and immediately added another layer of fun to the gathering when everyone walked in. Keeping to the informal theme the menu included short ribs as an entrée with tarte tatin for dessert. Mr. and Mrs. Jonathan Pardee. Image property Bettie Bearden Pardee. You’ve accidentally burnt or dropped the main course and your house is filled w 12 very hungry guests. What do you do? What 5 to 10 things should we have on hand for a last minute get together with friends. At our house that would be…salad fixings, jars of curry sauces (ie. Sharwood’s Red Curry with lemongrass), Jasmine rice, Hubbard’s Virginia salted peanuts, charcuterie selections ( sausages, artichoke hearts, olives, sundried tomatoes) eggs, potatoes… and a variety of ice cream bars and sandwiches. Don’t forget the benefit of a well-stocked freezer!! What makes a party perfect? Do you have 1 or 2 entertaining tips for the novice? Don’t step outside your comfort zone. Luckily there’s a lot of latitude today in entertaining styles, from the very casual to the extra formal. (My Texas friends have come up with a happy combo that speaks to this point – “denim and diamonds.”) Serve what you know best and are comfortable with; guests would rather be at a chili party, enjoying your family’s winner of a recipe, than trying to gulp down some fancy dish of the moment that you felt obliged to serve. Nancy Lancaster-Her Life, Her World, Her Art; Doodling in French-How to Draw with Joie de Vivre. ....lipstick (and some attempt at makeup.) It’s prompted by a mantra from my mother that I fondly recall, “put on a little lipstick, sweetie.” To her, that one gesture seemed guaranteed to solve any problem or dilemma that came along. Under consideration…adding a painted striped tent on the ceiling of our master bedroom…which would first require a redefinition of the original as-built design. I invite you all to visit Bettie’s website, Private Newport, for gardening, styling and entertaining tips as well as regular sneak peeks into the élite world of Newport, Rhode Island. You can also follow Bettie on Pinterest, Twitter, Facebook, and Instagram. Style is not just about how clothes look on a person, but how they feel; it's about form and function. When someone is uncomfortable it shows and they then tend to look awkward. Whether it's an ill-fitting undergarment, pair of shoes or pants that might not outwardly look wrong, the moment one feels uncomfortable all sense of "style" is gone. Discomfort leads to awkwardness which is never chic. Shoes are quite often the greatest culprit. Uncomfortable shoe pain is the worst. There's a shoe for every moment. Flats, kitten heels and low sling-backs are great for the office. A more serious heel is perfect for a more formal affair, a night out on the town, at a restaurant, or a party where you know you'll not need to spend too much time on your feet. For those times when you're on your feet all day - sightseeing, walking to work or running errands - and for those who work in more creative environments, we sing the praises of the sneaker. And, as with every other article of clothing much depends on the pairing. I've had a long history-slash-love-affair with sneakers over the years for fashion and fitness. I remember wanting a pair of Adidas and how terribly disappointed I my mother came home with a generic pair that had 4 stripes along the sides instead of 3. The next pair proved to be the real thing. The iconic Stan Smiths. Classic. Clean. Crisp. White. I wore them with everything from shorts to skirts and sundresses to my school uniforms. From there we graduated to Nike. The swoosh had made it's grand debut and was all the rage for both stylish and fitness reasons. I remember first stepping into a pair. I felt like I was jumping on a cloud. From Stan to the Swoosh we then moved on to the Ultimate Preppy Tennis Shoe. Though no one I know actually wore their Tretorns for tennis. The little triangle on the sides of the canvas sneakers came initially in traditional white, navy and red. Soon, though they were available in a myriad of colors - pastel pinks, yellows, greens and even plaids. The terry cloth insole gave these sneaks their distinctive comfort. (Tretorn has since tried for a comeback but it's stiff and uncomfortable and the lines aren't at all the same. Alas, their reincarnation did not pass the test.) I wore my Tretorns with my Polo shirts. I had a collection of them with more colors than the rainbow, due to the fact - I am quite certain - that Ralph Lauren was one of my father's clients. In those days we wore our Polos layered, multi-colored, collars popped. Naturally. 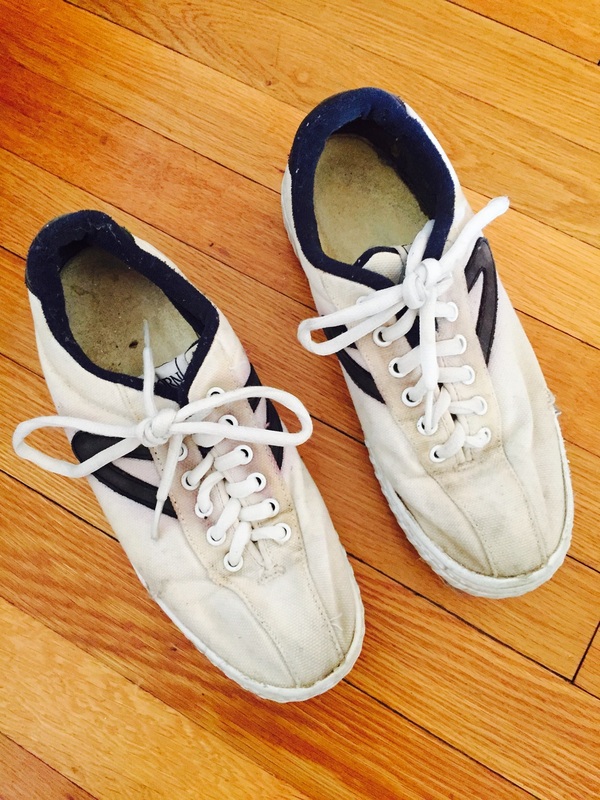 And while the Tretorn never fell from grace - I still have the last of my original pairs, I had a brief affair with the all-white K-Swiss, and then later, as embarrassed I am to admit, the Reebok which was a sensation delivered to us from across the Pond. I will happily tell you I never owned any but the white and no high-tops in either color ever made it into my closet. (The stirrup pants I had did plenty mde up for that fact, and are probably worthy of a story of their own.) I don't remember much past the Reeboks and am glad that my relationship with them was very short lived. Once I graduated from college and was forced to grow up, my shoes did as well. Ballet flats, loafers and driving moccasins became the comfort shoes of choice. Lately I've been doing a lot of walking around - city walking. The aforementioned aren't always the most comfortable when you're on your feet and walking around all day long. And I started to notice the sneaker once again. I started noticing that all sorts of well dressed people were wearing sneakers. Europeans do all the time, and they wear them well. We've not always been able to pull that look off. But we're starting to and we're starting to wear them well, whether little white sneaker, running shoe, tennis shoe or the casual canvas or leather slip on. And so I recently bought myself a pair - a pair of faux snake skin slip on leather ones that seem to work well with leggings or jeans. But then I wondered, am I too old to carry this off? Nearing the end of my 40s am I supposed to dress a certain way? Or is style all about attitude? Are there rules as to who can and cannot wear a little tennis shoe? Or are these rules meant to be broken? I happen to love the look. I happen to love the idea of being comfortable. I happen to like breaking the rules as well. Check out the images below and tell me what you think. Below the last pair of my beloved original Tretorns. These shoes are a part of my personal history! Below my latest comfort shoe acquisition. 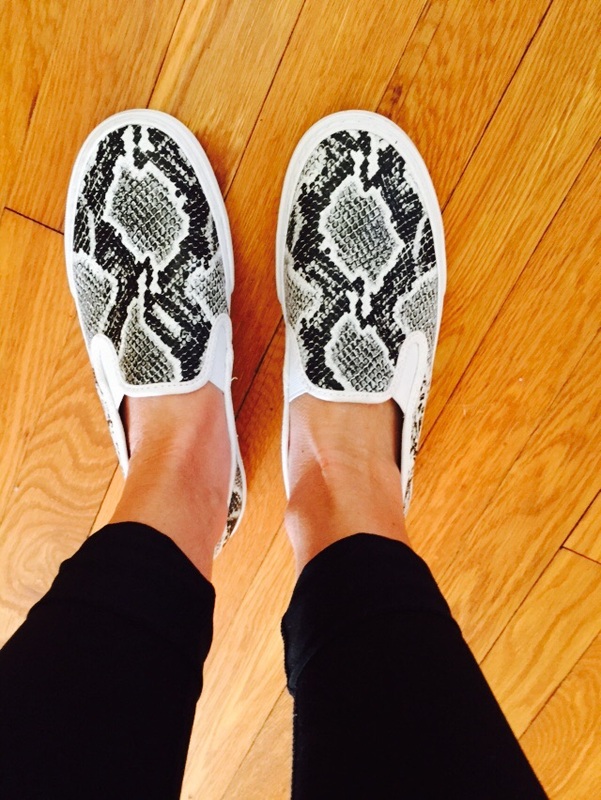 These comfortable, stylish slip-ons come from The Gap. These are perfect for long days of walking around and standing. They're more comfortable than my ballet flats - younger and hipper to boot. And so the question still stands. Am I too old for these shoes? I happen to adore tunics. I own many of them in all sorts of different styles - long, short, dress, casual. It seems that with each and every year that passes new ones appear in my closet and yet the older ones never get tossed aside -they really are timeless. The definition of tunic is fairly loose - According to Merriam Webster a tunic is: "a loose piece of clothing usually without sleeves that reaches to the knees and that was worn by men and women in ancient Greece and Rome; a long shirt worn by women that reaches to or just below the hips or a long jacket with a high collar worn by soldiers, police officers, etc." For this reason there are many styles that can be described as a tunic. Below are 10 reasons we think it is a must for every wardrobe. 2. They are universally flattering. They look well on everyone - whether tall, short, thick or thin. 3. The tunic is versatile as it can be worn alone or over a pair of chic pants, jeans or leggings. 4. Tunics can be dressed up or down and they're available in a multitude of styles to best complement your wardrobe. 5. Whether you're tastes as classic, boho, preppy or urban chic, there's a tunic just for you. 6. Tunics look well on any age group from 20 to 60 and beyond. 7. Tunics transition well from night to day and from season to season. 8. Tunics are forgiving - They won't feel too tight when you've decided to have that tiramisu after your nice dinner out. 9. Because of their versatility and comfort tunics make a great travel garment. 10. Tunics are widely available at every price point. A bit boho chic with a classic twist. This is one of those tunics that transitions well when worn with a pair of gladiator sandals or little white sneakers to a pair of sophisticated slingbacks or mules paired with an elegant purse. Feel free to dress this one up or down. Originally found on Cleobella. This preppy casual tunic is a perfect weekend dress. Via JCrew. This white tunic is refined, simple, elegant and has a classic twist. From work to evening this tunic transitions perfectly. Image via Devon Baer Design. Simple, classic and elegant this tunic dress is as at ease over a pair of well tailored black pants as it is on its own. Image via Vogue UK. Perfect on a hot summer's day whether walking to work or a stroll along the avenue this simple white linen tunic complements any age and flatters every figure. This tunic from The Daily Chic is hip and stylish. Worn with thigh high boots this tunic is also quite edgy. The little black dress in a tunic. Worn over jeans. Chic and hip come together via Brit+Co. This simple tunic dress has a relaxed elegance and serves as the perfect cocktail or evening dress. Image originally via Glamour UK. Shop for tunics at the following stores, Banana Republic, Lilly Pulitzer, Anthropologie, Ann Taylor, Saks Fifth Avenue, J.mcLaughlin, J Crew and many more. Last week, on a beautiful sunny, but oh so chilly afternoon I headed into the city to celebrate the Fifth Anniversary of Modenus, to see many of my design friends and to attend press day at The Architectural Digest Home Design Show. The first event I attended was the Anniversary Celebration for Modenus which was held at the Press Lounge, described by The Gothamist as "Heaven in Hell's Kitchen," overlooking the magnificent Hudson River. (If you remember I went to London in September of 2013 as a member of BlogTour which was sponsored by Modenus and numerous other companies.) Modenus is a fascinating yet simple notion like no other. It serves as a one-stop shop for all things related to design. It serves to connect clients and designers, manufacturers with consumers, and even bloggers with bloggers. The Modenus website offers a beautifully curated collection of products and brands from around the world, and shares anything that strikes their fancy with the hopes that it will also strike yours. For more visit them here. And so, on a cold but spectacular crystal clear evening we set out to celebrate and congratulate Veronika Miller, founder of Modenus, as we sipped prosecco and nibbled on bread and cheeses and charcuterie on and caught up with old friends that we don't get to see nearly often enough. The Press Lounge sits atop the 148ink hotel and offers the most spectacular sweeping views of Manhattan. Image property of The Entertaining House. The Press Lounge bar was the perfect setting for a party that celebrates design and designers. Image property of The Entertaining House. The wine and prosecco flowed into glasses and flutes as we celebrated late into the night at the Press Lounge. Image property of The Entertaining House. Despite the cold and windy temperatures outside, the rooftop bar was warm and inviting as the sun started to set over the Hudson River. Image property of The Entertaining House. View from the top of the Press Lounge. Image property of The Entertaining House. "Prosecco and the City" - Atop the ink48 Hotel in the Press Lounge. Image property of The Entertaining House. Some of the guests admiring the scenic views from The Press Lounge. Image property of The Entertaining House. Modenus Founder Veronika Miller and Leanne Wood Newman of Flying Camel Advertising, Design & PR. Image property of The Entertaining House. Everything about New York, including the Press Lounge, is more magical after dark. Image property of The Entertaining House. As much as I look forward to the Architectural Digest show each year, DIFFA's Dining by Design is my sweet spot. (DIFFA stands for design industry foundation fighting Aids.) Here tables table are created by various top designers and vary from simple and minimalistic to lavish and opulent, outrageous and whimsical - a theatrical backdrop created on a dining room table. This year DIFFA moved out of it's old home in Pier 94 and into its new one right next door at Pier 92. I loved the new location. It was bright and spacial. The tables, for the most-part, didn't wow me this year quite as they had in the past. Although I and many of my peers found it to be a little lackluster, there were a handful of absolutely incredible tables that stood out for their creativity, beauty and presence. Some of my favorites are below. Despite the big white flakes that fell all around the harbor, Stacy Garcia's table showed the hope and promise that Spring was just around the corner. Image courtesy Architectural Digest. Stacy Garcias' whimsical ode to spring is like an invitation to her garden table. Image property of Jessica Gordon Ryan. Whimsical garden creatures artfully set the stage in Stacy Garcia's ode to spring. Image property of Jessica Gordon Ryan. The new York Design Center's Marks & Frantz pay a tribute to old Hollywood with a touch of drama and glamour. Here we feel as though we've been given a sneak peak behind the curtain. The setting was opulent and magical. Image courtesy Architectural Digest. I loved this festive table by Hunt Slonem for Kravet. Slonem is known for Neo-expressionist paintings of exotic animals and tropical plant life. Here art is beautifully translated into into a collection of fun and whimsical fabrics, papers and carpets. Image property of Jessica Gordon Ryan. These wonderful plates by Slonem for Kravet would look lovely on my Easter table! Image property of Jessica Gordon Ryan. Slonem for Kravet. Plate detail. Image property of Jessica Gordon Ryan. Kravet had two tables this year. This one, bright and happy, brings us from the soft, cool springtime colors to the warmer, bolder colors of the tropics and nature in full bloom in this inviting table setting. Image property of Jessica Gordon Ryan. Detail of the Kravet table. Image property of Jessica Gordon Ryan. Corey Damen Jenkins "Branches Out" with Beacon Hill Designs. Inspired by the organic beauty of Rio de Janeiro this table's careful and intricate setting plays homage to the city's sophisticated and edgy design combined with that of the bohemian. Image property of Jessica Gordon Ryan. Intricate texture and color create a sophisticated and elaborate setting in Jenkins's design for Beacon Hill. Image property of Jessica Gordon Ryan. Detail of a lamp used in "Branching Out" by Jenkins that celebrates the natural influences inspired by Rio de Janeiro. Image property of Jessica Gordon Ryan. Always sublime, always elegant, the Hermès’s table, under an ornate equine decoration, featured the brand’s new tableware line, Voyage en Ikat. Image via Jessica Gordon Ryan. Hermes DIFFA table Detail. Image via Jessica Gordon Ryan. The folks at Ralph Lauren never disappoint. This year the brand celebrates its new line of paints in with bright, cheery and colorful florals. Image via Architectural Digest. Details of the Ralph Lauren table. Photo credit Linda Holt, Linda Holt Interiors. Detail of the Ralph Lauren DIFFA table. Photo credit Linda Holt. Linda Holt Interiors. This spectacular table created by the folks at Architectural Digest takes homage to the Château de Groussay which was built in 1815 but underwent an expansion in 1952 that included the addition of several follies on the grounds. The Tartar Tent, constructed in 1960 resembles a 1781 structure at Drottningholm Palace in Sweden. Image via Architectural Digest. Detail of The Architectural Digest table for DIFFA's Dining by Design. Image via Jessica Gordon Ryan. I hope you enjoyed this brief sneak peak into the wonderful world of DIFFA's Dining by Design. I hope you will consider attending next year. The event's dates will be March 17-20, 2016. The Mule makes a grand re-entry and is a must have shoe for every wardrobe. Image via All For Fashion Design. Click HERE to be redirected to an updated version. It's become the much anticipated yearly event. Once a year, during the third week in March, The Architectural Digest Home Design Show sponsored by Architectural Digest and The New York Times, take over pier 94 overlooking the Hudson River. Members of the trade and homeowners flock to this great event to learn about the latest and greatest in home design and technology - it's where art, science and technology come together for the home. This year color and design seemed to take front and center stage in all areas of the home from kitchens and baths to home accessories. Having attended for several years now, I've noted subtle changes from year to year, some for the better, some not. Last year, I left a bit disappointed and felt the event had turned more into a kitchen and bath show. This year, I have seen notable improvements in the layout of the show making the floor much easier to navigate - from the placement of the coat check to additional seating for weary feet. While the kitchens seemed to take center stage, I was glad to see more furniture again this year. As always I love the MADE section - the smaller artisans, and the addition of smaller home accessories into the mix. Below is just a sampling of some of the many and varied finds. Vetro Vero always captures my attention. Sleek, elegant and sublime, from stemware to barware, to vases and pitchers, these hand-blown, modern Venetian designs by Michael Schunke and Josie Gluck are stunning. Find modern Venetian style goblets, functional wine decanters, stemware, and inspired home decor in bright jewel tones and smokey neutral colorways. Vetro Vero hand blown glass designs include Flat Pitchers, color-block Incalmo Vases, graceful Tapered Bottles and functional Flower Vases have garnered attention from such publications as Veranda, Elle Decor, Vogue, Traditional Home, Brides to name just a few. For more visit their website. This magnificent agate table immediately caught my attention. It comes to us from The Matthew Studios collection which is inspired by nature and incorporates material that deeply resonate with founder, Katherine Wildt O'Brien, such as rough quartz crystal, semi-precious gems, exotic skins and lucite. For more information on this and other agate tables, please visit her website. Pendant light from Hubbardton Forge, the oldest and largest commercial forge in the country had so many wonderful designs this year. The company was founded in 1974 - Watergate was the big scandal, The Sting was the box-office hit, and artists and entrepreneurs George Chandler and Reed Hampton fired up their first blacksmithing forge in a drafty old Vermont barn. Today, Hubbardton Forge is the oldest and largest commercial forge in the country with a team of over 200 people creating hand-forged lighting of timeless beauty and artistry…an American wrought-iron renaissance. For more and to view their entire product line please visit their website. Carolyn Cartwright creates her lamps in the tradition of the Venetian masters, with a more modern approach. She creates her lamps to give focus and expression to a space. Her aim is to make objects today that will become the heirlooms of tomorrow. Her lamps are spectacular in color and shape. For more information please visit her website. I loved this lamp. I don't know who the designer is but it was on display with The Lacquer Company. I'm madly in love with everything about The Lacquer Company. Founded in 2008 by James Lowther, the designs are clean, modern and sensible yet retain the English influences from his first job at Colefax & Fowler in London. Lowther's design projects mix classic and modern elements and can be found in numerous apartments, townhouses and beach houses in Manhattan and the Hamptons. Lowther bought his first piece of lacquer when travelling in Burma fifteen years ago; a century-old betel box in burnt orange that, even today, remains one of his favorite things. It was from that experience that he learned about the lacquer process and began to appreciate the patience, skill and attention to detail that goes into the finest examples. Lowther has partnered with such talent as Rita Konig, Martin Brudnizki and Steven Gambrel who have collaborated on the design. For more please visit the company website. LAFCO New York is among one of my most favorite fragrance companies. LAFCO (Luxury Articles and Fragrance Company) was established over 20 years ago when founder, Jon Bresler, quit his job as a lawyer to pursue his passion for body care. In 1992, Jon began travelling across Europe, foraging for hard-to-find specialty items and learning about how they were made. He supplemented his research with a self-imposed apprenticeship to study the nuances of alchemy and perfumery. As Jon grew fascinated with the rich histories of these disciplines, he envisioned LAFCO as a company that would actively participate in their preservation. LAFCO grew as Jon trained with internationally renowned creators of natural skin care and perfumes, and eventually imported their entire collections. He carefully maintained the spirit and integrity of every line as he brought them together to recreate an authentic European apothecary experience in his native New York. Products range from soaps (both hard and liquid) to candles and diffusers, to hand cream. Using only all-natural ingredients, these products emit the most wonderful, natural and clean fragrances that are neither too potent or too mild. WIth stores in New York City and Dallas, you can also find their products at various boutique store across the country, as well as on line. The packaging is as exquisite as the products and will enhance any home. For more visit their website. Ping Pong for the luxury set. This gorgeous glass ping pong table designed by Calma e Gesso brings the game to a whole new level. For those seeking to bring recreation out of the basement and playroom this may be what you're looking for. Grace and elegance, clean modern lines make this luxury item perfect for the home for those who work hard and play hard. Until now, one may not place the words sophistication and ping pong together in the same sentence. How much will this set you back? Just a cool $30K! Smeg is an Italian company has captured my heart and attention. What beautiful design and such graceful looking products ranging from tea kettles to blenders and mixers to ovens to beverage coolers. I will write more on them at a later time. At House of Rohl you'll find that authentically crafted faucets and fixtures are more than just form and function. They are truly pieces of art made by artisans using skillsets that have been passed on from generation to generation. Each fixture celebrates craftsmanship, heritage and authenticity. Whether formal and sumptuous or simple with clean linear lines. Each piece is crafted with precision. For more information on House of Rohl and to see their extensive collection, please visit their website. To see these and hundreds and hundreds more visit The Architectural Digest Home Design Show's website. And be sure to wear flats or comfortable walking shoes! I was quite taken by these Nestled Cylinder Pendants from Jamie Harris Studio.Made in New York, these pieces play on stacking geometric forms to create sophisticated lighting structures that illuminate with elegance. Colors and fixture are custom-designed for your project. Available as individual pendants, or can be built into chandeliers in any shape. For more information visit Jamie Harris Studio. This wood assemblage by Michael Sanzone was created from wood found at an Irish whiskey distillery. For more visit Kathryn Miriam's website. Eric Trine describes himself as a "I'm Eric Trine. I consider myself an object based studio artist and designer, or more simply, a maker of things." He designs by making instead of by drawing. Each idea starts with a tool instead of a pencil. For more on the artists and his creations, visit his website. Mehmet Cetinkaya Gallery brings us beautiful fabrics from Istanbul. For more visit their website. Cowhides and bold graphics create a modern juxtaposition between material and pattern. The rug’s outline is natural and unique to each piece. Each one is hand painted in Brooklyn. For more visit Avoavo. Gorgeous linens and home accessories from Japanese-made Rikumo. Everything old is new again and this Kickback Coffee Table is the perfect example. This table was designed for the music lover who takes his downtime seriously. It’s the ultimate table to come home to after a long day—with a recessed area to house a turntable, a side cutout for an amp, a niche for over 120 albums, and a solid brass inset to hold a whiskey or wine bottle (or ash tray if you live in a legal state). Kick back, enjoy a drink or a smoke, and when side A comes to an end, no need to get up—just lean over, flip the record, and pour another finger. For more information visit the Atocha Design website. I was quite taken by the beauty of these glass decanters by Chesterfield Glass Art. Mitchell Black, a new tradition for gift and home is new to the show this year. It is a nod to the past and a focus on the present. This celebrates the aesthetic from the past through modern living. It all began in 2012 from a collection of vintage copper and silver plate etchings. I loved the modern whimsical accessories. For more visit their website. What's the newest shift in fashion? Dresses? Pants? Both! Fashion is never constant. It's constantly evolving, refining, and always borrowing and often improving from the past. From the runway to the streets I've been noticing a shift toward wearing dresses over pants. While it may sound silly, even confusing to some, it's a look that when done properly can look refined, sophisticated and effortless. This look transcends your wardrobe's functionality, giving your garments a greater range of wear; from casual to elegant, from day to night this pairing seems to be what every girl's wardrobe needs. Additionally, this look works well in every season and can help bridge your wardrobe from one season to the next. How are these being paired? We're seeing long dresses and thigh-skimming shifts worn with pants in all sorts of styles from skinny, to cigarette to those more full in form. This is a look that is easy to create and pull off, however, by that same token, it's also a look that can look terribly wrong when not done properly. Stick to like items. For example do not pair a short evening dress with a pair of jeans and expect to be taken seriously! What do you think? Is this something you think you could pull off? Dressing for the change of seasons - White jeans and fur can co-exist beautifully! How to dress for the season when the weather simply cannot make up its mind! It's that time of year. Mother Nature will be taking us on her erratic roller-coaster-weather journey. It will be hot one day and frigid the next. What to wear seems to take on an entirely new meaning this time of year. Spring makes it's debut next Friday. But what exactly does that mean? While we equate Spring with warm sunny days, green grass, buds bursting, and flowers blooming, in much of the country Spring doesn't really arrive until well into May and until then we're sort of in limbo. How does one dress when the early morning thermostat still reads 30 and yet, when the sun shines down on us brightly during the afternoon hours, we're all ready to take out our summer wardrobes? The key to dressing well this time of year so that we look appropriate and feel comfortable is simply by layering. Layers can be peeled off as the temperatures rise, and then put back on as they start to cool again. But there's more to it than that. Almost anything goes. Gone are the rules that white cannot be worn until the end of May. Yet, a frilly, gauzy sundress certainly would not be appropriate (at least in the Northeast) until temperatures reach into the 70s in succession. And fur looks silly then. And long, down puffer coats worn with little sandals looks silly as well. But a trench coat, worn over a warm sweater with strappy sandals is perfectly acceptable - so long as there's no snow under foot. Right now, while the thermometer is erratic we can pull items from both summer and winter wardrobes. The key is to be appropriate. The key is to look appropriate. While we are all ready to pack up our scarves, boots and heavy coats, to do so would be premature. Even though we've been enjoying temperatures well into the 50s, Mother Nature has been known to dump snow on us well into April in the past. And I wouldn't put it past her again. As much as we are eager to break out our sandals and pastels, we'll need to keep some cold weather items on hand, for a while longer. I believe in dressing for the weather as opposed to dressing for the season. And since the weather is a little bit winter and a little bit spring, that's how we'll dress. We will layer colors and textures and fabrics. If you've tucked your white jeans away for the winter, even though Memorial Day seems eons away, it's really ok to bring them out and put them on. Pair them with darker and more neutral colors so that they are worn appropriately. White jeans are seasonally perfect when paired with a dark colored jacket, sweater and boots. As the weather continues to warm replace the boots with pumps or flats. Or maybe you still prefer to wear darker colors, blacks, navy, grey. Liven up these dark tones with pops of bright and pastel. A white, beige or pastel coat will lighten up your wardrobe perfectly. Replace tights with leggings and show a little skin. Boots can still be worn with dresses with or without tights. The wonderful thing about fashion today is that almost anything goes and the rules are all meant to be bent. Take off the boots and show a little skin! Winter fabrics like fur, leather and velvet can still be worn for a while. A lavender trench jacket lightens up the leather pants, as do the metallic shoes. If you're a boot person, rest assured you can still wear them - with or without hose. Leggings worn with skirts and dresses in lieu of tights offer a more casual look... It feels good to show some skin! With the melting snow and spring showers, bright, colorful wellies are always in style! Have you ever noticed that some people just seem to always be so well put together, while others, seem to always miss the mark? It's not about the pricetag as much as it is about the pairing. It's perfectly acceptable to mix a TSE cashmere sweater with a pair of Old Navy jeans (if those are what fits you best.) It's perfectly acceptable to mix costume and real jewelry. It's perfectly acceptable to mix casual and dressy. And, it's perfectly acceptable to take classic pieces and make them your own. Greatly influenced by my mother and maternal grandmother, I describe my style as classic with a twist. I like to take the classics and play them up. I like to look timeless yet modern with bright bold color and patterns. While I love all things elegant, graceful and sophisticated, I don't take myself too seriously - and playful, whimsical and unexpected elements are a must! A classic wardrobe is one that has items both new and old, but has been cultivated for many years.It's not about the label so much as the fit. A classic wardrobe is a wardrobe that fits well with a few well-made pieces of great quality. Well made classic items not only never fade from style, but if well maintained will truly stand the tests of time. There's no need to get rid of your favorite cashmere sweater simply because you got it when you graduated college. If it has been cared for well it may last long enough to pass on to your own daughter! There's no need to toss aside that perfectly tailored navy Ralph Lauren blazer simply because it was your first real purchase. Simply give it a fresh modern-day look by pairing it with a pair of cigarette pants or your boyfriend jeans. Believe it or not, the best way to update your wardrobe is not by shopping for items that are trendy, but those that are classic. A little black dress - We think the more the merrier. While classic colors are grey, black, navy, white and beige, these are often punctuated by bright pops of red, yellow, pink, green and blues. Patterns like gingham, check, stripes and animal print punctuate a classic wardrobe. A beige trench is a must! A white shirt is essential to a classic wardrobe whether worn untucked or neatly tucked in. Pearls... pearls and more pearls! Every classic girl has her pearls, both real and costume. Hair worn pulled back will never fade from style and perfectly complements a classic wardrobe - Plus it shows off those fabulous pearl earrings! Cigarette pumps have lasted the test of time ever since Audrey Hepburn first slid into a pair. They're elegant, stylish and universally flattering. Worn casually with ballet flats or dressed up with pumps. Is there a modern day woman who does not own at least one little black dress? A classic wardrobe must! Don't forget to add a little color to your classic wardrobe! Described as the South's most inviting designer, Barbara Westbrook shares her principles for creating beautiful homes that are warm and inviting in her first book, Gracious Rooms. This beautiful book is filled with rich, inspirational images and advice. Westbrook has been designing classically inspired homes with Southern charm and European elegance for over twenty years. Whether it's a fetching country cottage or a sumptuous penthouse apartment, Westerbrook offers advice with polish and patina. Her philosophy is quite simple. "Make it interesting. Make it beautiful. Make it personal. Make it welcoming and warm." Westbrook walks her readers through 10 stunning homes. You'll visit light-filled lake retreats, contemporary houses, and historic mansions. Throughout these homes she shares her straightforward, usable ideas. Westerbrook imparts her views on symmetry, the use of natural elements in design a room, and color as a means of unifying spaces within a home and creating a mood with materials. Through combining these elements of design and decoration, she turns houses into homes. Her thoughts are. "Make it interesting. Make it beautiful. Make it personal." This is a book that is poised to grace every elegant coffee table, book shelf or library no matter the reader's prefered style. I first fell in love with the look of exposed brick walls during my Boston years where they are prevalent in many of the older Brownstones, restaurants and shops. These walls convey a feeling of warmth and enveloping comfort. To me, the exposed brick reflected the city's rich history while embracing the youthful flair and artsy style of a modern generation. They were "Hipster" before "Hipster" existed. The look of exposed brick inside the home is seeing a new popularity. To trace their popularity, one needs to look at the history of American architecture. Brick became a popular building material during the Georgian era (1700s). The Georgian style had a traditional, stately appearance that appealed to many and was tremendously popular in England. Masters of all crafts trained and specialized in this style. It's popularity took off and found its way across the Pond to the New England and the Southern Colonies. Initially, American Georgian homes were built of wood but those with means, who could afford more expensive and luxurious materials were drawn to brick. The Georgian style of architecture led the way to the Federal style and these styles are still found in the historic cities and towns (like Boston, Nantucket and Newport) along the Eastern seaboard. Though architectural styles have changed, brick remained a popular building material. Because cities like Boston have much of their original architecture intact, interiors with exposed brick walls are prevalent. Brick remains a popular material, less from an architectural viewpoint, and more from the world of interiors. And while there are many "modern" homes with new brick, there's something to be said for the rusticity and the history of the old. I have deep appreciation and fondness for all things old, historic and traditional and combining them with items from a more modern lifestyle. Whether in an historic New England home, a farmhouse kitchen or an urban loft with high ceilings and oversized windows, the look of exposed brick complements a multitude of lifestyles and decorating styles.